6 "Emergency Conference of New Voters"
In 1951 Lowenstein was president of the National Students Association. In 1967, Allard Lowenstein convinced Senator Eugene McCarthy to challenge Lyndon Johnson in the Democratic primaries. McCarthy demonstrated that anti-war politics could be winning politics and brought along Robert Kennedy, not to mention hundreds of thousands of new political activists. Two alumni of Stanford returned to the area November 1969 to voice opinions on the Vietnam War and the Moratorium at a press conference preceding a Democratic fund-raising dinner. Senators Alan Cranston of California and Frank Church of Idaho began an informal news conference at a Los Altos residence by citing examples of recent teamwork in the Senate. Cranston pointed out that he had supported Church's attempts to nullify Rule 22 of the Senate procedures, the filibuster regulation. "As usual, we lost," Church said. The senior Senator from Idaho praised Cranston's efforts supporting a resolution of Senator Aiken of Vermont which would clarify a long-standing misinterpretation of US foreign policy. Cranston's amendment to the resolution states that this country's diplomatic recognition of another nation does not constitute American approval of that nation. This resolution could ease the way of future attempts to extend US diplomatic recognition to Communist China. Both Senators were in substantial agreement as to the withdrawal of US forces from South Vietnam. Senator Cranston clarified his position by stating that he would not support a unilateral ceasefire, because that would leave US troops at the mercy of an army which has shown little respect for past ceasefire agreements. Senator Church, while commending the Moratorium, said that it had "dangerous potential," and that the Administration would probably continue attempts to "defuse" the grass roots movement. Such an attempt would consist of two steps: First, a stepped-up withdrawal rate of US combat forces, and second, a full, complete military disengagement from the conflict. The Idaho legislator said that no "halfway attempt" of the President would placate Americans in regard to the cessation of hostilities in Vietnam. Church felt that Nixon's announcement of a speech on the subject (set for tonight) was meant to take some of the steam from the October 15th protest. Cranston added that the President probably does not know exactly what his talk will propose even at this late date. Senator Church favored a pullout of all US combat troops from Laos and Cambodia at the same time as the Vietnam disengagement. He criticized the fighting in Laos as the "first time the United States has engaged in an undisclosed foreign war." In conversation later, Senator Church stated that if public opinion had not been so intense against the policies of the Johnson Administration in Southeast Asia, "we would now be involved in a land war with China." A member of the Senate for ten years, Church said that he would support the Moratorium as long as it remained peaceful and as long as the President did not substantially change his policies on the war. Senator Cranston reported that he had been working with members of the House, including Representatives Reid (R-New York), Don Edwards ( D-Ca li fornia), and Allard Lowenstein (D-New York) to sustain the Moratorium as a "peaceful, non-violent" protest. In response to a question as to whether he conceived of America's purpose as one to act as "policeman" of the world, Church replied that, while the US should remain free to offer non-military assistance to foreign nations, foreign governments "should look to their own resources." To substantiate this view, Church reported that President Kennedy's original intention was to aid the South Vietnamese regime with everything but combat troops. "Emergency Conference of New Voters"
In an effort to increase student power in electoral politics, an estimated 1600 Bay area students will gather November 18, 1971 at 8:30 p.m. in Memorial Auditorium to voice their opposition to President Nixon and the Vietnam War. Main speakers at the rally will be Republican Congressman and Presidential candidate Pete McCloskey, (R-San Mateo); former New York Congressman Allard Lowenstein (now Chairman of the Americans for Democratic Action); Senator Alan Cranston (Dem.-Calif.) and John Kerry, spokesman of the Vietnam Veterans Against the War. The "Emergency Conference of New Voters" is being organized by the student body presidents of 19 local colleges and universities to "ignite students into seizing the political process to change the country," according to ASSU co-president Larry Diamond. The student leaders feel that although President Nixon is winding down that war for middle class American college students, he is increasing the horrors for the victims of our bombing policy in Cambodia and the two Vietnams. They assert that the President has no moral justification for his policies and that he has been dishonest in presenting those policies and their effects to the American people. In keeping with the goal of increasing student political power those attending the rally will have the opportunity to register to vote in California elections. Between 7 and 8 p.m., a preliminary conference will be held on registration laws and on 1972 convention delegate selection and party reform.. Explaining that the 19 colleges to be represented at the rally have 189,000 potential voters enrolled as students, a rally organizer warned President Nixon that "We've got the votes, we're getting organized and by 1972, we'll drive you out of office." In addition to the four main speakers, those scheduled to appear at the rally are Congressman Donald W. Riegle, Jr. (Rep.-Mich.); State Senate Majority Leader George Moscone; Assemblyman Willie Brown, (Dem.-San Francisco); Assemblyman John Vasconcellos (Dem.-San Jose); and Yvonne Westbrook, the 18 year old black woman who ran for a seat on the San Francisco Board of Supervisors this year. The Conference is the twenty-fourth and last in a series of local rallies held across the nation since May in such diverse locations as Providence, R. 1.; Minneapolis, Minn.; and Austin. Texas. 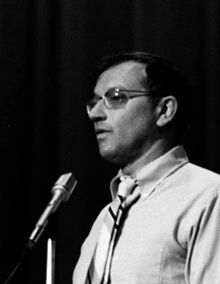 ADA Chairman Lowenstein, who led the "Dump Johnson" movement after 1967, has been providing volunteer manpower to aid most of the local rallies. A national conference of new voters will be held at. Loyola University in Chicago December 3-5. A similar conference in 1967 endorsed Senator Eugene McCarthy's candidacy for President. The ASSU is now raising funds from private sources to send Stanford delegates to the Chicago conference.